Bárcena Mayor. Travel 2017. Day 6. Sat. September 30/17. The Great Mosque of Córdoba. La Mezquita. Inside the Great Mosque of Córdoba, Spain. Córdoba’s Cathedral is a Mosque! Inside the Alhambra. The Nasrid Palace. Alhambra. A Case of Two Palaces. San Baudelio. A Gem of Mozarabic Architecture. Church Architecture and the Reconquista. Gaudí. La Sagrada Familia. History. Painting in Spain’s Golden Age. Overview. Golden Age Religious Painting and Flemish Influence. Golden Age Art: Religion, Politics, Art in the 16th Century. Spain’s Jamón Ibérico. The World’s Greatest Ham. Spanish Food History: The Early Days. Spanish Food History: The Romans. Conversos and Moriscos: Tyranny of Food. Iberians and Celts in 19th and 20th-Century Spain. Visigoths in Spain. Arrival and Legacy. Spain. Visigoths and Unity: Monarchy. Religion. Law. Al-Andalus. History of the Rise and Fall of Islamic Spain. Al-Andalus: 10th Century. Abd al-Rahman III. Al-Andalus. 10th Century. Córdoba and Culture. Almoravids in Al-Andalus. 11th Century. Almohads in Al-Andalus. 12th Century. Mudejars. From Survival to Conversion. Moriscos. Their History in Spain. Asturias. León. History of Early Christian kingdoms. Pamplona. Navarre. History of Early Christian kingdoms. Castile. Early History and Formation. Alfonso X, el Sabio 1221-84. Politics. Alfonso X. El Sabio: Language and Law. Alfonso X. El Sabio: Histories and Translations. History of the Jews in Spain to 13th Century. History of the Jews in Spain.14th-Century. History of the Jews in Spain. Early 15th-Century. History of Spain. 16th Century Overview. Ferdinand and Isabella: Catholic Monarchs. Politics. Charles V of Spain. Politics. History of Spain.18th Century. Overview (2). History of Spain.19th Century. Overview. Spain. The Peninsular War 1808-14. Anarchism in Spain in the 19th Century. History of Spain. 20th Century. Overview. Spain. Restoration 1902-1931. The Monarchy. Spain. Restoration 1900-1923. The Military. General Miguel Primo de Rivera: The Rise of a Dictator. General Miguel Primo de Rivera: The Fall of a Dictator. Second Spanish Republic 1931-36. History. Overview. Second Spanish Republic 1931-36. Transition to Provisional Government. Second Spanish Republic. The Church June 1931-November 1933. Second Spanish Republic. Agrarian Reform June 1931-November 1933. Second Spanish Republic. Military Reform June 1931-November 1933. Second Spanish Republic. Regional Autonomy. June 1931-November 1933. Second Spanish Republic. 1931-33. Unions and Forces of Order. Casas Viejas, January 1933. A Spanish Tragedy. Second Spanish Republic. Nov 1933-Feb 1936. The Right Takes Charge. Second Spanish Republic. Nov1933-Feb1936. The Left Reacts. Second Spanish Republic. February 1936-July 1936. Prelude to Civil War. Spanish Civil War: An Overview of the Causes. Spanish Civil War. War Breaks Out. Spanish Civil War. Objective Madrid. Spanish Civil War. Republican Disunity. Spanish Civil War. International Context. Spanish Civil War. An Uncivil War. Spain after the Civil War. International Relations. The Catholic Church and the Spanish Civil War. The Catholic Church after the Spanish Civil War. GRANADA Spain to the 17th Century. GRANADA Spain from the 17th to 20th Century. SEVILLE. 16th and 17th Centuries. CATALONIA. Early History to 1000 AD. Catalonia History: 11th and 12th Centuries. Catalonia. Towards a Catalan Voice. ARAGON. Early History to 1137. Poema de Mío Cid: Is the Cid Spain’s Hero? Poema de Mío Cid: A Different Hero. Alfonso X el Sabio and Poetry. Spanish Ballads. Historical Overview to Civil War 1936-39. Spanish Ballads. Metre. Rhyme. Style. Spanish Ballad. De amores trata Rodrigo. Spanish Ballad. Encima del duro suelo. La Celestina. Author. Genre. Location. La Celestina. The Upstairs World of Calisto and Melibea. The Downstairs World of Celestina. La Celestina. Challenge and Innovation. La Celestina. Daily Needs and Survival. Spain Golden Age Literature. Background. Spain Golden Age Literature. Overview. Romances of Chivalry. Definition and Characteristics. Amadis of Gaul. The Art of Storytelling. Spain. Romances of Chivalry. Popularity. Spain. Romances of Chivalry Decline. Garcilaso de la Vega 1498?-1536. Life and Fame. Garcilaso de la Vega. Poetic Innovations. Garcilaso de la Vega. Sonnet 1. Cuando me paro … Analysis. Garcilaso de la Vega. En tanto que de rosa… Analysis. Lazarillo de Tormes and Reality. San Juan de la Cruz: Noche oscura. Analysis. San Juan de la Cruz . Llama de amor viva. Analysis. Góngora. Mientras por competir… Analysis. Quevedo. El Buscón. Book I. Summary. Quevedo. El Buscón. Book II. Summary. Quevedo. El Buscón. Book III. Summary. Guzmán de Alfarache. From Equality to Heroism. Guzman de Alfarache. New Epic or Novel? Cervantes. Life. Part I. 1547-80. Cervantes. Life. Part II. 1580-1616. Cervantes: What is it about Titles? Cervantes: What is it about the title “Don Quixote”? Don Quixote Part I (1605). Summary. Don Quixote Part II (1615): Summary. Don Quixote: A Famous Failure. Don Quixote. Hero or Fool? Don Quixote and the Real World. Part I (1605). Don Quixote and the Real World. Part II (1615). Don Quixote’s Squire Sancho Panza. Don Quixote. An Authoritarian’s Nightmare. Don Quixote. Hero or Religious Extremist? La vida es sueño. Summary. Life is a Dream. La Vida es Sueño. Act I. Scenes 1 and 2..
EL Burlador de Sevilla. Summary. Spanish Coast. La Costa Verde. Spanish Coast. La Costa Vasca. Spanish Coast. La Costa Cantábrica. Travel Itinerary: 2013 Trip to Spain. Travel 2017: Itinerary and Arrival. Travel 2017. Day 1. Madrid Bilbao. Travel 2017. Day 3. Argoños. Travel 2017. Day 4. Santillana del Mar. Travel 2017. Day 5. Comillas. Gaudí’s El Capricho. Travel 2017. Day 6. Bárcena Mayor. Travel 2017. Day 7. Santillana to Oviedo. Travel 2017. Day 8. Oviedo Bárzana. Travel 2017. Day 9. Oviedo Ribadeo. Travel 2017. Day 6. Bárcena Mayor. Saturday, September 30/17. Still in Santillana del Mar, we woke up to rather damp, dismal weather, but since it wasn’t actually raining we decided that we would go ahead with our plans to take a trip inland up the River Saja valley to the village of Bárcena Mayor, set in the Saja-Besaya Natural Park. A distance of about 50 kilometres/ 30 miles. After breakfast at Posada Araceli, we set out taking with us a load of laundry. No, we weren’t going to wash the clothes in the river nor in any of the lavaderos (covered stone water troughs where village women used to meet to launder and gossip) we were certain we would find in any of the villages on our route. We had been told that there was a lavandería (laundromat) in Puente San Miguel, on the way. Amazing! Like the lavandería earlier in Santona, this one was new and clean, and powder added to the washing machines automatically. However, we ran into a minor irritant: there were two washing machines which functioned perfectly but only one of two dryers was working. With only a few minutes left in our wash, a man entered and filled the dryer with clothes already washed (probably at home), which meant that we had to hang around until the dryer became free (and make sure that no other newcomer jumped the line!). But we were pleased to get the laundry done. We followed the River Saja edged by green pastures with thickly forested hills rising on both sides. En route to Bárcena, near Los Tojos. Sand and gray-coloured stone farmhouses with wooden balconies and red-tiled roofs dotted the meadows. Cows –mostly black and white friesians and prolific milkers– grazed in the fields; their milk is turned into highly prized cheeses, butter and other dairy products of the area. Beef and veal from Cantabria are also highly valued, especially those coming from the native Tudanca breed, which unfortunately is becoming increasingly scarce. The forests are home to wild boar and deer whose meat figures prominently in local cuisine. The forests and mountains are also home to the endangered Iberian bears or wolves. As we travelled along the winding road, we wondered if any of them might be silently watching us from the upper reaches of the forests. We passed through quaint, sleepy villages and branched off near tiny Correpoco to follow the River Argoza to Bárcena Mayor. Here the road ends. 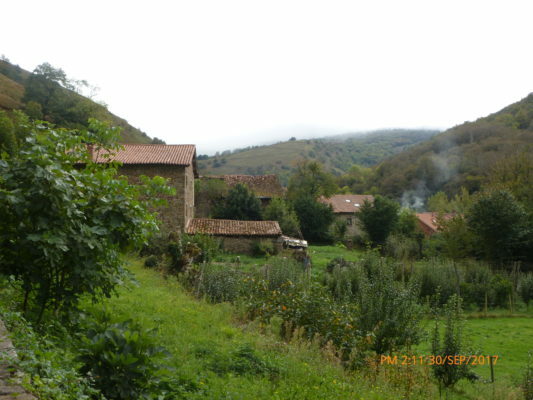 Isolated where the Argoza valley narrows into a hollow, and surrounded by sloping pastures and forested hills, Bárcena Mayor’s agricultural economy has now given way to tourism as its main source of income. 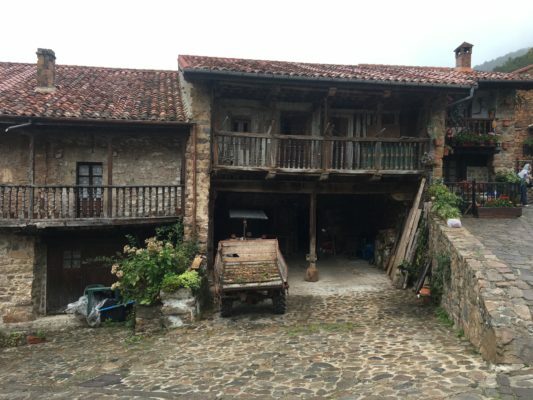 If you want to get a good idea of traditional Cantabrian architecture, Bárcena Mayor is a very good place to start. Most of the buildings have been renovated but retain the essential characteristics of typical, local architecture: two-storeyed stone houses, the lower level housing animals (or farm equipment now), the upper –with prominent wooden balconies- being the living quarters, warmed by the heat produced by the animals beneath. Bárcena Mayor. Wooden balconies with space beneath where animals were once kept. Now has tractor and trailer. Bárcena Mayor. A picturesque house. Many balconies are festooned with flowers in pots hanging from balconies. A few dilapidated houses remain whose exteriors convey a romantic notion of village life in the past, as do the two fountains and three lavaderos where people would meet and exchange gossip and local news. 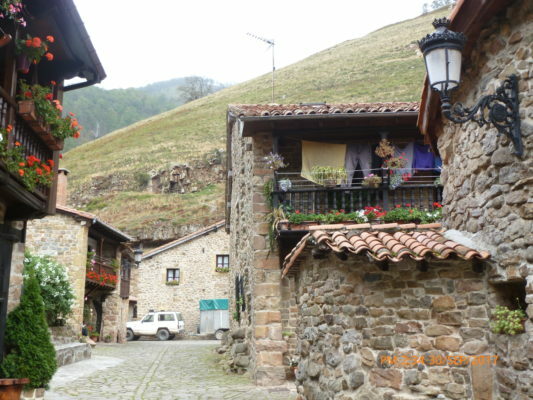 Bárcena Mayor is a compact village with all buildings located on the north side of the bubbling River Argoza (which is really no more than a wide stream). A narrow, single span, stone bridge leads to a hermitage along a path on the other side. The path is now part of a series of hiking trails that radiate out from the village. Predictably, the largest building in the village is the 12th-century church of Santa María. Even so, it is modestly sized and its squat, square tower is only a little higher than the roofs of the houses. It was relaxing strolling through the irregular, cobbled streets where only residents are allowed to drive. Tourists park in a lot on the edge of the village. A hidden corner. Bárcena Mayor. There are hidden corners, small squares (plazas), and from almost any angle we could see the surrounding hillside pastures and tree-lined hills. Bárcena Mayor. A typical street. The largest square has a lavadero, now dry and unused, right in the centre. After a leisurely stroll, it was about 2.30 p.m. and time to eat. Like many of the villages that we passed through, Bárcena Mayor, has its share of restaurants. These are fundamental to the tourist economy, and if our experience is anything to go by, they serve excellent food. Of the three that we saw in Bárcena Mayor, we chose Restaurante Rio Argoza set alongside the river and close to the bridge. Bárcena Mayor. Restaurant Río Argoza. The dining room is large with windows running along the river side and an open air extension covered by umbrellas. It was very busy and we had to wait a while for a table. But the wait was worth it. 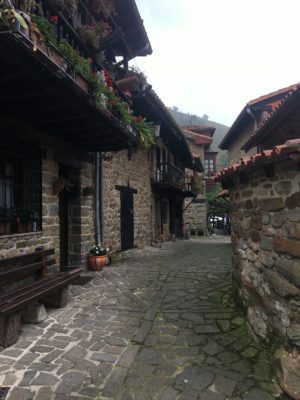 Inland Cantabrian food typically consists of hearty stews (cocidos), different cuts of meat e. g. veal (ternera) fillets, beef tenderloin, wild boar (jabalí) sirloin or chops, suckling lamb (lechazo), roast venison (venado), accompanied by potatoes and peppers. Sea fish too is common and shouldn’t be overlooked if meat is not your thing. The sea is less than 40 kilometres/25 miles way, and they do know how to prepare fish in these inland restaurants. I always go for a cocido montañes (mountain stew) when I am in the north, Margaret chose trout stuffed with ham. We shared an excellent mixed salad. My cocido, filled with chunks of pork, white beans, potatoes was delicious as was the trout. With home-made bread, a glass of wine and dessert (arroz con leche: rice pudding for me, home-made pastry for Margaret), the bill for both of us came to 40 euros. 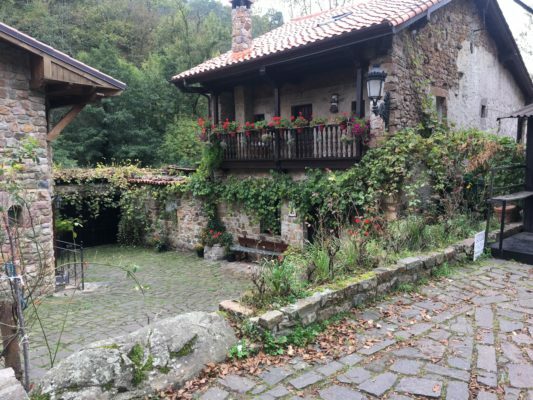 We were back in Santillana by early evening, relaxing in Posada Araceli’s little garden. A final stroll through the town, now far less crowded, and it was time to call it a day. Bullfighting in Spain • Jamón ibérico • Spanish Food. Introduction. • Food. From Early Days to the Romans. • Food. Al-Andalus. Agriculture. • Spanish Food. Ziryab (789-857). • Food. Al-Andalus and cookbooks. • Conversos and Moriscos: Tyranny of Food. The Earliest Years • Spain in the Palaeolithic Age • Copper Age: Antequera. • The Iberians in Spain • The Celts in Spain • Iberians and Celts in 19th and 20th-Century Spain • Tartessus • The Phoenicians in Spain • The Greeks in Spain • The Carthaginians in Spain • Roman Conquest of Hispania • Rome and Hispania • Roman Roads in Hispania • Roman Towns in Hispania • Rome. Hispania, Christianity • Visigoths in Spain. • Visigoths or Invisigoths! • Visigoths and Unity • Visigoths and Jews. • Al-Andalus: Rise and Fall of Islamic Spain • 8th C Al-Andalus: Invasion • 8th C Al-Andalus: Consolidation • 9th C Al-Andalus • 10th C Al-Andalus: Abd al-Rahman III • 10th C Al-Andalus: Cordoba and Culture • 10th C. Al-Andalus: Al-Mansur • 11th C al-Andalus: Taifa kingdoms. • 11th C al-Andalus: Almoravids. • 12th C al-Andalus: Almohads. • Al-Andalus: Survival of Granada • Al-Andalus: Economy • Al-Andalus: Dhimmis • Al-Andalus: Muwallads • Al-Andalus: Mozarabs • Mozarabs: Resistance Accommodation • Mozarabs: A Controversial Term • Mudejars • Moriscos • Early Christian kingdoms: Asturias, León. • Early Christian kingdoms: Pamplona, Navarre. • Early Christian kingdoms: Castile. • Alfonso X, el Sabio: Politics. • Jews in Spain to 13th Century • Jews in 14th-Century Spain • Jews in Early 15th-Century Spain • Jews and Conversos in 15th-Century Spain • Conquest of Granada • 16th C Spain. Overview: Politics • Catholic Monarchs: Politics • Carlos/Charles V: Politics • 17th C Spain. Overview: Politics • 18th C Spain. Overview: Politics (1) • 18th C Spain. Overview: Politics (2) • 19th C Spain. Overview: Politics • The Peninsular War 1808-14 • Restoration 1875-1902 • Anarchism in 19th-century Spain • 20th C Spain. Overview: Politics • Restoration 1902-1923: Regeneration • Restoration 1902-1931: Alfonso XIII • Restoration 1900-1923: The Military • M. Primo de Rivera: Coup and Success. • M. Primo de Rivera: Fall. The Second Republic. Introduction. 3/18• Spanish Civil War: The Opening Salvo • Spanish Civil War: Objective Madrid. • Civil War: The Republic. • Civil War: International Context. • Spain’s Uncivil War. • Franco Crusader Saviour? • Civil War and the Catholic Church • Franco's Spain & International Relations • Franco and the Catholic Church • Córdoba: Historical Overview • Granada to the 17th Century • Granada from the 17th to 20th Century • Seville to 1500 • Seville: 16th and 17th Centuries • Seville from 1700 • Toledo: Historical Overview • CATALONIA: Early Days to 1000 AD. • Catalonia 18th Century • Catalonia. 19th-Century Politics. • Catalonia Renaixença • Towards a Catalan Voice. • Catalonia 1900-1923 • ARAGON: The Early Days. Poema or Cantar de Mío Cid: Summary • El Cid: Brief Biography. • Poema de Mío Cid: Spain’s Hero? • Poema de Mío Cid: A Different Hero. • Book of Good Love: Libro de buen amor • Book of Good Love: Ambiguity • Book of Good Love: Love and seduction • Ballads/Romances. Historical Overview to Civil War (1936-39) • Ballads/Romances. Origins. Classification. • Ballads/Romances. Metre, Rhyme, Style. • romances-ballads-de-amores-trata-rodrigo-2-18 Celestina: Summary • Celestina: Author, genre, location • Celestina: The World of Calisto and Melibea • Celestina: The World of Celestina • Celestina: Challenge and Innovation • Celestina: Daily Needs and Survival • Celestina: Interpretations • Spain Golden Age Literature: Background • Spain Golden Age Literature: Overview • Romances of Chivalry • Amadis of Gaul: Summary • Amadis of Gaul: What is it about? • Spain: Romances of Chivalry Popularity • Spain: Romances of Chivalry Decline • Garcilaso: Life and Fame • Garcilaso: Innovations • Garcilaso: Sonnet 1 • Garcilaso: Sonnet 23 • Lazarillo de Tormes: Summary • Lazaro: The Letter Writer • Lazarillo: Cynic,Saint, Knight,? • Lazarillo de Tormes and Reality • San Juan de la Cruz: Noche oscura. • San Juan: Llama de amor viva. • Góngora: Mientras por competir… • Quevedo: Poderoso caballero. • Quevedo: ¡Ah de la vida!... • Quevedo. El Buscón Introduction. • Quevedo. El buscón Book I Summary. • Quevedo. El Buscón Book II Summary. • Quevedo. El Buscón Book III Summary • Guzmán de Alfarache. • Guzmán de Alfarache. From equality to heroism. • Guzman de Alf. New Epic or Novel? • Cervantes: Life Part I • Cervantes: Life Part II • Cervantes: What is it about titles? • Cervantes: What is it about the title "Don Quixote"? • Don Quixote Part I (1605): Summary • Don Quixote Part II (1615): Summary • Don Quixote and Fame • Don Quixote: Hero or Fool? • Don Quixote and the Real World Part I • Don Quixote and the Real World Part II • Don Quixote: Sancho Panza • Don Quixote: An Authoritarian’s Nightmare. • Don Quixote: The "True" Story • Don Quixote. Hero or religious extremist? • Fuenteovejuna: Summary. • La vida es sueño: Summary • El burlador de Sevilla. Summary • Don Juan...the Devil. • Don Juan and Honour. General Map of Spain • Geography • Coastal Regions • The North Coast • Las Rias • La Costa Verde • La Costa Cantábrica • La Costa Vasca • The Mediterranean Coast • La Costa de la Luz • Mountains • The Meseta • Rivers • Water Problems • Spain: UNESCO World Heritage Sites • Visiting Córdoba. • Visiting Toledo • Travel Itinereray: 2013 Trip to Spain • Travel 2013: Barcelona Arrival • Travel 2013. Day 1. Barcelona • Travel 2013. Day 2. Barcelona. • Travel 2013. Day 3. Barcelona to Cuenca. • Travel 2013. Day 4. Cuenca to Granada. • Travel 2013. Day 5 (1). Granada. • Travel 2013. Day 5 (2). Granada. • Travel 2013. Day 6. Las Alpujarras. • Travel 2013. Day 7. Granada La Hoya. • Travel 2013. Day 8. La Hoya to Carmona • Travel 2013. Day 9 (1). Carmona Seville. • Travel 2013. Day 9 (2) Seville. • Travel 2013. Day 10 (1) Carmona Cordoba. • Travel 2013. Day 10 (2) Cordoba Almagro. • Travel 2013. Day 11. Almagro to Madrid • Travel 2013. Day 12 (1) Madrid. • Travel 2013. Day 12 (2) Madrid. • Travel 2013 Day 13 Madrid to Segovia. • Travel 2013 Day 14 Segovia El Burgo de Osma. • Travel 2013 Day 15 Berlanga, Baudelio, Gormaz • Travel 2013. Day 15 (2) Calatanazor. • Travel 2013. Day 16 Burgo de O to Sos del Rey C • Travel 2013. Day 17 Sos and Leyre Monastery. • Travel 2013 Day 18. San Juan de la Pena and Alquezar. • Travel 2013. Day 19. 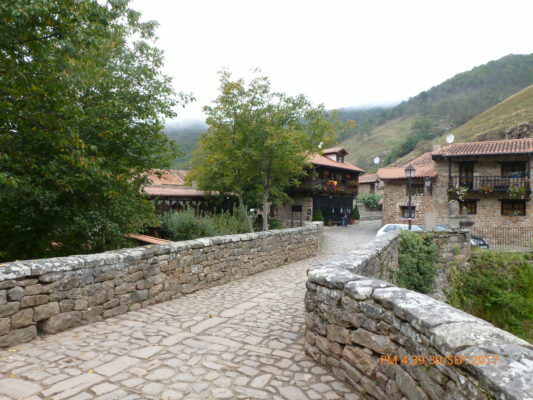 Alquezar. Copyright © 2009 Spain Then and Now. All Rights Reserved.